Subsequent to its worldwide launch on Friday, Apple's Leopard system was updated on Friday to address some issues witnessed with the new Apple operating system. The update - dubbed Login & Keychain Update 1.0 - is a 10MB fix that resolves issues with upgrades from Mac OS X 10.1 Wi-Fi users, as well as FileVault, Apple's optional security program for users' documents. According to Apple, the free update fixes logging in with an account originally created in Mac OS X 10.1, or earlier, that has a password of eight or more characters. Besides that, the update addresses user issues experienced when attempting to connect to some 802.11b/g wireless networks, as well as problems associated with changing the password of a FileVault-protected account. Interestingly enough, the Login & Keychain Update 1.0 also highlighted a change to the way updates are handled in Leopard as compared to previous iterations of the OS. Instead of installing upgrades immediately, as had happened in Tiger, new updates are now installed just before a restart or shutdown. 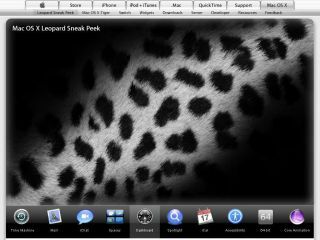 Earlier this week, Apple also released Leopard upgrades for GarageBan, Aperture, Backup, iLife Support and iDVD in preparation for the Leopard release.